It looks like the VID and PID for the amp have changed for the V2 which I just got yesterday. I'll work on adding them over the next few days. It looks like the defaults are all the same, so I'm hoping that it will just work. If anyone has a Mustang I V2 and can get the VID and PID for it, I can add that too. Based on Jamie's fork I was able to successfully compile plug for my Mustang V2. If anyone is interested I modified the USB PID in the mustang.h file to match my V2. I added the new PID on my fork (in a backward compatible way, the old ones will still work) and it connects but I'm getting random segfaults. I'm guessing the protocol has changed slightly. I don't usually work on C++ apps (I'm a webdev guy) so it could be something dumb I did in the code, though I can't see it. @Piotrek, how are you reverse engineering the protocol? Are you hooking it up to FUSE in Windows and watching the USB traffic with a debugger? I have FUSE working with the amp through VirtualBox. I'll try to figure out what's different with its connection. @Travis Sheldon were you having any trouble with Plug once it connected? I haven't seen any other segfaults when I tested after rebuilding from scratch this morning. I've submitted the commits in pull request #1. OK, I'll try to do some testing over the next couple of weekends and try to diff what's available on FUSE vs. what's currently available on PLUG to figure out what's new. I haven't worked directly with external hardware before so bear with me. Also please check the PID of the amp when in update mode and either update you fork, add functionality in update function and create another pull request or report them directly to me and I will add the code. This works for Mustang I V.2, although I haven't yet tried update mode. good to see what you are doing for Mustang V2 development. Thanks for this great project! I tried it with my Mustang II V2 and I have reproduceable segmentation faults when trying to load the last preset from the amp. I think that is quite obvious, because there are 26 presets shown, but there are only 24 presets available in Mustang II. @tkampeis , I haven't had time to add support for the new effects yet. For the Mustang 1 V2 the VID is 1ed8 and the PID is 0014. Effects Diatonic Pitch Shifter – new pitch effect providing diatonic harmonizing capability Improved Chromatic Pitch Shifter (stays in tune better, less warble) “Greenbox” - “Orangebox” “Blackbox” “Big Fuzz” “Ranger” From the Mustang Floor: Touch and Pedal Wahs are available in both Stomp and Mod categories. I hope my usb sniffer will work to get the hex codes for the settings. Guys, please, can any one of you (who have it) turn Mustang 1 v2 or 2 v2 into debug mode and give me the PID? Also PIDs for 3-5 v2 in both modes would be helpfull. I'd like to release PLUG v1.2 and this are the things that I'm missing. I noticed a lot of the times if the device was unplugged from the computer while plug is running then the only way to get it to connect again was to close the application and relaunch. I couldn't not do disconnect/connect. @Travis Sheldon Thanks, but I think that what you posted is PID in normal mode. PID in firmware update mode is different than in normal, playing mode (at least on v1 devices). Can you please confirm that this is a PID in firmware update mode? It was not. I will get that in a few hours. I can confirm that I see the same IDs Thomas S-A reported for my Mustang I V2. I tried downloading the source, modifying the Mustang.h file and rebuilding. There must be more to it that that. I still see the error that no suitable device was found. I know the electrical stuff is OK cause the same connection, same computer works fine when I reboot into Windows and launch FUSE. I know you can't just go out and buy every amp to play with them. If there is some data we could provide that would help, just say what and how to get it. I've been a full time Linux user since 2006 and a guitarist since nineteenmumble :) Just bought a Mustang IIv2 and would love to be able to tweak it with my reshly installed Debian desktop (it was Kubuntu yesterday). I've installed the mustang-plug app but get an error message when I click on "Connect" (Suitable device not found!). 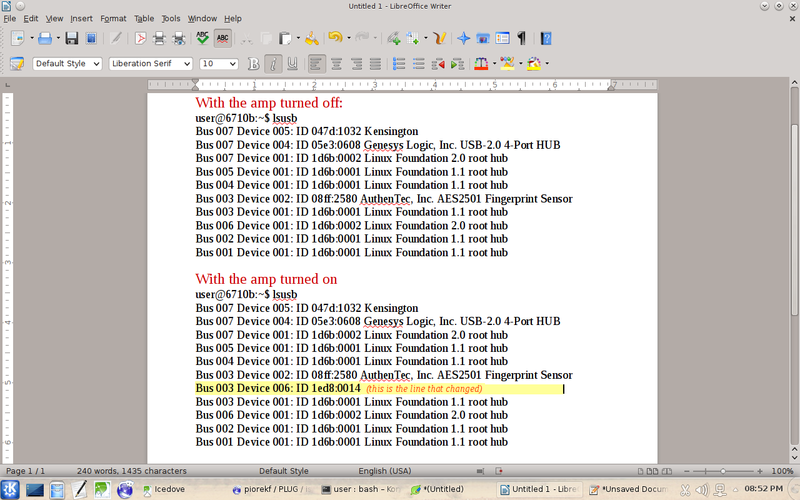 I've run the lsusb command requested above and copied the output to LibreOffice so as to highlight the significant bits. I'm not a novice Linux user but neither am I a programmer and I'll do all I can to help, up to and including making a donation for your trouble. @eldergeek If you are installing version from repo then you have PLUG 1.1 and Mustang II v2 is supported since version 1.2. You either have to compile it from source yourself (it should be easy) or find if anybody already created a deb package with version 1.2 (I can see that PLUG 1.2 is available for Debian testing). but the software insists there's an update and I'm not at all sure how to go about getting that. I'm able to connect to my amp now but there's clearly a learning curve with this software because I wasn't able to figure out how to read the parameters of any particular preset. Still, I'm ahead of where I was so I'll persist in hopes of sorting it out. :) Thanks again! I compiled v1.2 from the source on here today (Linux Mint), and it works correctly with Mustang I V2. I added the new device ID to the udev rules (Device 6, ID 14), and had to pull in libusb-1.0.0-dev to satisfy build dependencies (expected this). Thanks a bunch for the tool. Also, it looks like v1.2 will be in the October 2015 Ubuntu release, so hopefully Don's problem is automagically solved here in a month or two. I downloaded and installed the deb package and it sees my amp but I wasn't entirely able to figure out how to use it. I keep saying I'm going to get back into it but I have one preset tweaked and sounding good (using a neighbor's Windows machine) so I'm out of "panic" mode. I suppose that means I'm in "round tuit" mode but a friend is mailing me an older Win7 Home laptop so I know that, one way or the other, I'll get it sorted out eventually. Thanks y'all. Bus 007 Device 014: ID 0b05:5601 ASUSTek Computer, Inc.